WITH TIGER WOODS MIRED IN A FIVE-YEAR majors slump and youthful Rory McIlroy shut out in this year's majors, a fresh new face has emerged to challenge the record 18 professional major victories of Jack Nicklaus. It's a baby boy who, coincidentally, lives in the Columbus, Ohio, suburbs. (Nicklaus grew up in Upper Arlington.) The boy's identity is being guarded to avoid undue attention. The boy's parents claimed to have discovered their son's acute golf interest when he was an infant. The mother said his first eye movements were toward their giant flat screen TV during the Masters telecast in April. Two months later, their baby boy spit up when Phil Mickelson airmailed Merion's 13th green with a pitching wedge during the final round of the U.S. Open. The parents grew defensive when it was suggested that this type of behavior didn't necessarily mean their first child is the next Jack Nicklaus. The father is an insurance salesman and a weekend golfer with a handicap index of 24. The mother is the assistant director of a small daycare center. The so-called golf prodigy has yet to hold a golf club, but the father insists that it's only a matter of time before his son is putting heat on the Golden Bear. "He's right on pace, maybe a little ahead," the father said. "Nicklaus also had zero majors until the age of 22 years and five months, give or take a few days." If nothing else, the baby boy does look like a little golfer. 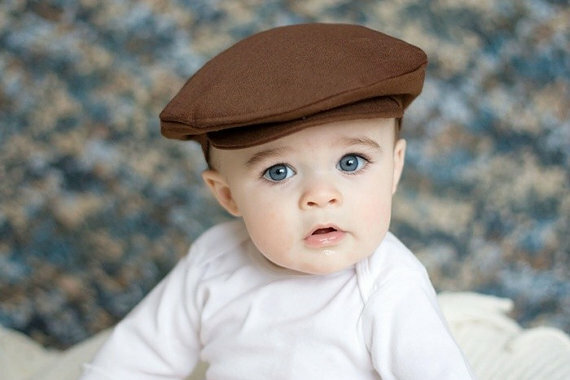 "He absolutely loves wearing his flat cap," the father said, "sort of in the style of Ben Hogan. No offense to Jack, of course." I am also currently on pace with Jack as far as majors won after age 60! Thanks for the reminder. We'll be keeping an eye on you! the baby is so cute. your blog is cool. Golf in The Azores: Best-Kept Secret in Europe? PGA Returns to Home of Robert Trent Jones, Sr.